Berkery Noyes Represents Performance Institute In Its Acquisition By Thompson Publishing - Berkery, Noyes & Co., LLC. SEPTEMBER 17, 2007, NEW YORK, NY – Berkery, Noyes & Co., LLC (“Berkery Noyes”), the leading independent investment bank serving the media, information, content and technology markets, announces that it represented The Performance Institute (“Performance Institute”) in its acquisition by Thompson Publishing Holding Co., Inc. (“Thompson”). Terms of the transaction were not disclosed. Performance Institute, widely considered the nation’s largest “good government” group, produces training programs and policy conferences for public officials. Through its print-based, online and live content, Performance Institute promotes the application of “performance-based management” practices at all levels of government, serving some 10,000 attendees annually. Founded in 2000 by Carl DeMaio, Performance Institute is a private corporation that pioneered an innovative model of fee-based training for government managers combined with self-funded, independent, and non-partisan research on best management practices. 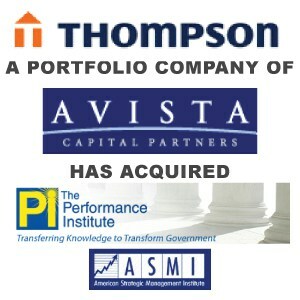 In 2003, DeMaio replicated the Performance Institute model for the private sector by founding the American Strategic Management Institute (“ASMI”), which is a separate corporation that will also be acquired by Thompson as part of this transaction. Carl DeMaio will continue as Advisory Board Chairman of both companies post-closing of the transaction. Headquartered in Washington, DC, Thompson is a leading business-to-business media company providing users with factual, “need-to-have,” timely information that simplifies and explains complex regulations. Thompson’s broad portfolio of market leading products and services are used by professionals in the fields of human resources, financial services, healthcare, pensions and benefits, grants and education, food and drug, environmental, law, and energy.